Sprinkler Irrigations Systems is a complete planning, reference, and design manual that explains how to plan, design, and efficiently manage a sprinkler system according to your needs. 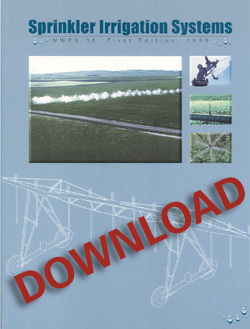 Useful to producers, students, agricultural consultants, engineers, equipment dealers, and government agencies. This is copyrighted material. A watermark will apper when printed.